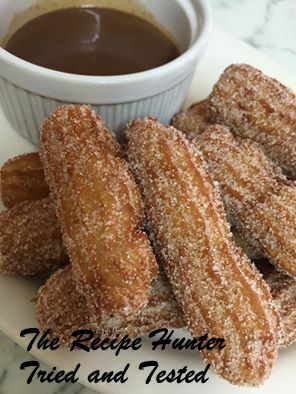 Tried out these yummy Churros with chocolate dipping sauce last night, they were absolutely divine! You will also need a star nozzle (I used a 4cm nozzle) and a piping bag. 1. Mix the 1/2 cup sugar and cinnamon powder and keep for later, to dip the Churros. 2. In a pot, add water, salt, sugar and oil and bring to a boil, stirring continuously to dissolve sugar. 3. After bringing to a boil, remove from the stove and add the flour and stir until a doughy ball forms. 4. Remove dough ball from the pot and fill the dough in the piping bag with the nozzle. 5. Pipe 8cm sticks on a baking sheet and keep for frying. 6. Heat oil on a medium to low heat so Churros can fry thoroughly, add two – three Churros at a time and deep fry until golden brown. 7. Transfer fried churros onto a paper towel and then into the sugar and cinnamon mix. 1. Melt chocolate in a pot, and add the 250ml fresh cream, stirring continuously. 2. Keep stirring until cream and chocolate have completely mixed and keep on the stove until the chocolate sauce heats up. 3. Remove from stove after chocolate sauce is heated and transfer sauce into a glass bowl. Serve the warm Churros on a platter with the chocolate dipping sauce and enjoy!